iOS 7 is here (you can download it now if you haven’t done so yet). 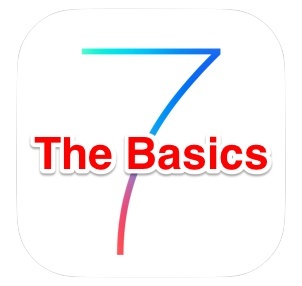 We’ll be covering tons of iOS 7 tips for iPhone, iPad, and iPod users, but first let’s run over four essentials to get everyone started; Control Center and it’s general greatness, quitting apps with the new Multitasking feature, searching your device with the revised version of Spotlight, and a nice change to the lock screen that will speed things up a bit. 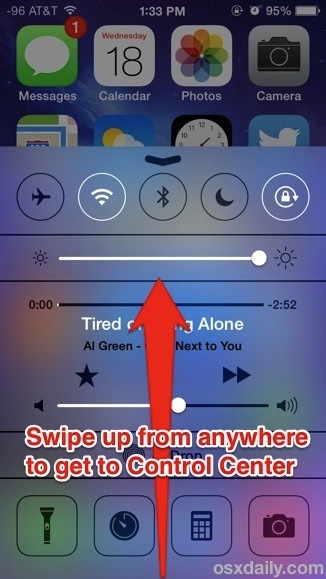 Control Center is awesome, and may wind up being one of the features of iOS 7 that people use the most. To access it, all you need to do is swipe up from the very bottom of the screen. Just a swipe up from the very bottom of the screen and you can get near instant access to all of that through a single panel. Great huh? 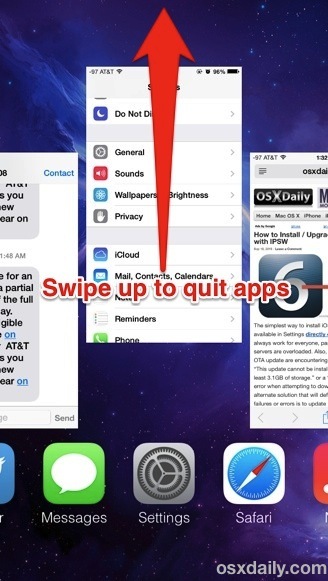 Want to quit an app? Bring up the new multitasking screen by double-taping on the Home button, then just swipe up on one of the app preview panels to quit that app. 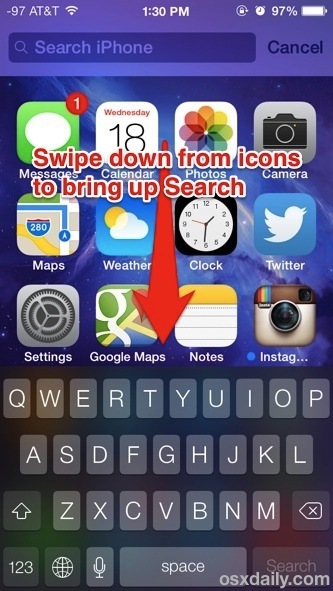 The upward swipe gesture will send the app off screen, closing it out in the process. This one is likely to be one of the more confusing changes for many users, since it behaves very differently from how it worked in prior versions of iOS with multitasking and quitting apps. Nonetheless, it’s also one of the better changes, and the new Multitask panel is awesome – swiping left and right lets you cycle through running apps just as it did in prior versions. Searching iOS used to have it’s own dedicated screen with Spotlight, but now you can search from any home screen panel just by pulling down on any icon to reveal the Spotlight bar. Note that if you swipe down from the very top of the screen, you’ll bring up Notification Center instead, thus you’ll want to focus on an icon and pull down from that instead. 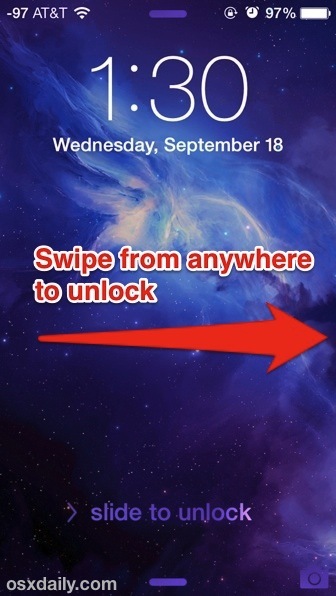 You can now swipe right from anywhere on the lock screen to unlock your device. No more precise swipes on the little “Slide to unlock” bar, just use that same gesture anywhere; the bottom, the middle, the clock, it doesn’t matter where, it will unlock. This is a nice change and it improves usability, making the unlocking process faster. (Side note: you should always use a pass code). OK, iTunes Radio has nothing to do with gestures or swiping around, but it’s awesome. If you are unfamiliar and haven’t tried out iTunes Radio yet, it’s a free streaming music service that is accessible from the Music app by tapping the “Radio” icon in the corner. 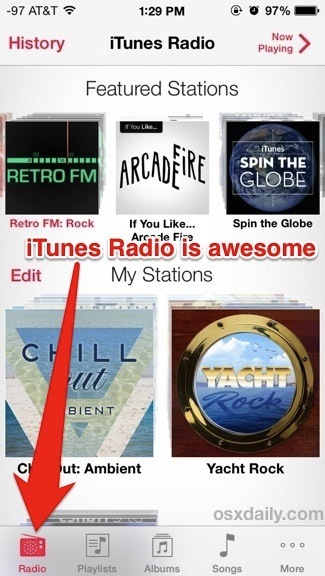 Select one of the preset stations, or make your own station based upon a genre, band, or song you like, and iTunes Radio does the rest… filling in an endless stream of music. Like a song? You can buy it. Don’t like a song? You can skip it. iTunes Radio is kind of like Pandora, but the discovery elements of it seem to be even better. Give it a try, it’s awesome if you want to hear your favorite classics, or find some new music. Oh, and iTunes Radio is on the desktop now too with iTunes 11.1.